-Herbed Roast Turkey with Lardo – You heard me: Lardo. The fatty and unctuous cured fatback of pork will be used to add flavor and richness to the turkey. How so? You know how it’s suggested to add butter between the layer of skin and the breast meat? Why don’t we do our best Emeril and kick it up a notch with lardo? Butter melts so quickly while lardo will render slowly releasing its fat into the turkey. Yeah, it’s not really French to mix protein sources, but I’m not French. And neither is Thanksgiving. This lardo idea is a tweak from the sausage -laced turkey idea I did last year that I learnt from Michael Symon during an episode of The Chew. We loved this. But the sausage gave up so much of itself during the long cooking process that while the turkey was great, the sausage was less so. Lardo to the rescue. 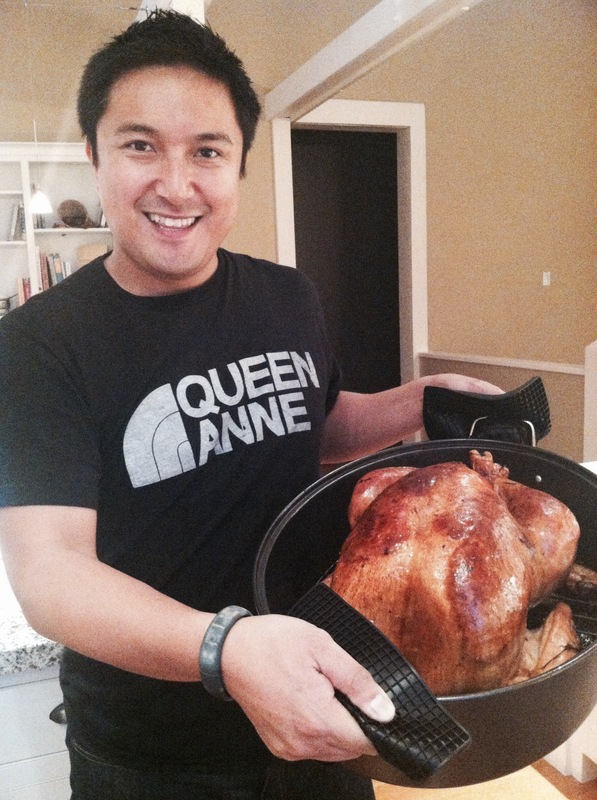 -Rotisserie Turkey – Yup, another turkey. We’re feeding 12, another turkey is a must. The property where we spend Thanksgiving has a huge outdoor grill with a rotisserie. We’ve never used the rotisserie and figure no time is like the present. I’m looking forward to tending the bird as it does its slow rotation to deliciousness over heat and smoke. Thanks goes to the folks at Serious Eats for the guidance. -Gluten-free dinner rolls – My friend, the Gluten-Free Girl, recently had this post on Food52 about a gluten-free dinner roll that also happened to be dairy-free and egg-free. I’ve taken this for a spin and it turned out great. Look forward to adding this to Thanksgiving dinner as there are members of our group that have allergies. But we’ll be subbing the almond flour for millet flour as there is also a nut allergy in our numbers. -Fried crescent rolls – You heard me: fried crescent rolls. The tableside favorite, but with a twist. The inspiration behind this was the famed Cronut ™ (trademarked name to Dominique Ansel) from New York City that was explosively popular when it was first introduced in the spring. The idea for the cronut was to have a croissant-donut hybrid. Take the best of both worlds for each and voila; the Cronut™. But I’m not about to make a laminated dough, so I’m going to take Pillsbury crescent rolls and reshape those to my leisure. Here’s how to do it; par-bake the crescent rolls for six minutes at 375. Pull them out of the oven and drop them into frying oil that’s been heated to 350. Make sure they are golden, brown, and delicious (about 2-3 minutes total) pull them onto a plate lined with a paper towel and there you have it. Feel free to drizzle chocolate, a glaze, or decorate with powdered sugar or a cinnamon sugar sprinkle. You’re welcome. The menu is still being finalized, but these are the dishes I’m excited about this Thanksgiving. What’s on your menu that you can’t wait start cooking? Happy Thanksgiving, enjoy the company of whomever you’re with, and see you around the table. We like wine. 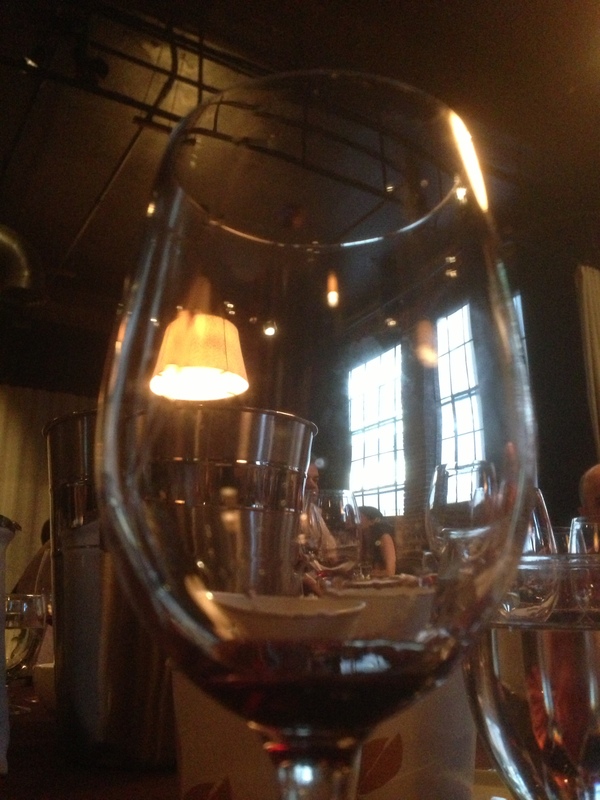 Using the royal ‘We’, America’s wine consumption is growing by the year. 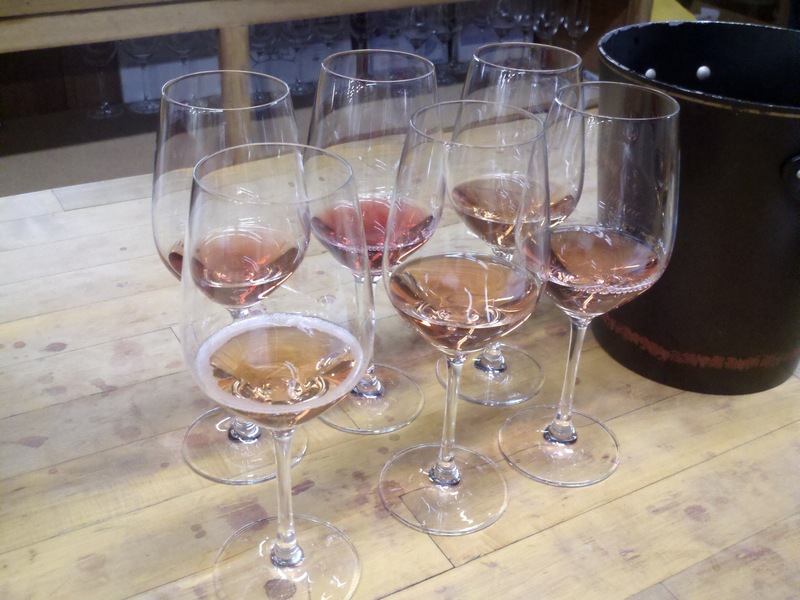 Join in the imbibing with these Seattle-area wine purveyors. Support local! Here is a quick rundown of area tasting rooms, shops, and retailers and the days where they do some pourings. Cheers. Or it could be titled “Places to eat in Texas, New York, California, and a sprinkling of other places”. But I get the Travel Channel’s title; short and catchy. A few weekends ago, the Travel Channel re-aired its series of shows touting its Chowdown Countdown. This has replayed every so often since its original airing a few years ago. It’s a mesmerizing collection of entertainment. They feature various eateries in their 101 Tastiest Places to Chowdown from hole-in-the-walls to renowned restaurants coast-to-coast. That said, I was entranced with the show and always had it on in the background as it aired. And I got some ideas for new places to visit. But there were some places that I would avoid. Sorry, but a five-pound burrito isn’t my idea of fun. I barely even stand some of the mega-burritos we have locally in Seattle, so there is no way I’ll go out of my way for that 80 ouncer. It’s an odd show, sometimes they’ll provide context to a place; tell a backstory, give sense of appreciating the people. For others, they zoom right by. And the show often leans heavily on certain states and cuisine. Texas, New York, and California are frontrunners. Are you from Virginia and think you have some hole-in-the-wall gems? Well, the Travel Channel doesn’t really agree with you, because Virginia is amongst the states that don’t have a single entrant. As for food, if you love barbecue, pizza, or fried chicken, you’re in luck. There are a ton of those types of places. I would’ve loved to some of the history on these places, learn more about their staff and why they are iconic. Alas, it wasn’t to be. For many of the restaurants that made the list, bigger isn’t better. Some of these places were jokes. When it comes to what I eat, I want to know the why, not just the what. The Travel Channel did a great job with the what. In many cases they just featured the dishes that were preposterously massive. But my main squabble is that they never talked about flavor and context. Why should I care about a 6 lb burrito? Or a 12 patty burger? Outside of horror, much of the list included places that had over the top dishes. Sorry Travel Channel, you had a window to shine a proper spotlight on cool places across America, but you reduced many of them to a gimmick. Not cool. If you can’t tell already, I’m conflicted with the show. It’s American to love lists. And to gripe about them. So yeah, well done Travel Channel, you got me talking about your show. As a proud Washingtonian, I had major beef that our state’s few representatives were Paseo and Beth’s Cafe. Paseo, I’m cool with because their sandwiches are delicious. As for Beth’s? Because it’s TV and cliched, they focused on Beth’s 12-egg omelet. Whoop-de-doo, it’s been featured before. And there are other mediocre overrated breakfast places in Seattle, so they went with the most obvious. Darn Texas took all of our other spots. In my eyes, in late summer/early fall 2013, there will be an inflection point in the world of food for this year. The Pacific Northwest will be the basecamp for this sea change. It also just happens to be on the same weekend. There is the delightful and decadent Feast PDX, presented by Bon Appetit; this will be the celebrity chef event driven down the I-5 South corridor to Portland. 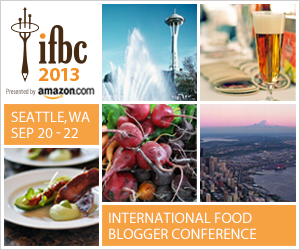 Here in Seattle will be IFBC 2013 (International Food Bloggers Conference), presented by Amazon.com. Hundreds of food bloggers will visit the Emerald City to network, eat, and converse about, well, food blogging. I’ll be attending IFBC this year and can’t wait to partake in all what the con has to offer. Though I would love to attend both Feast PDX and IFBC; alas, my X-Man alias is not Jamie Madrox, so I won’t be attending the Portland event. My physical self will be at the W Hotel in Seattle; the home base for this year’s IFBC. This is the fifth year of IFBC and I’m still kicking myself that I didn’t attend the inaugural in 2009. That year was crazy. At that moment in time, Twitter was truly cresting among food bloggers in the Seattle area. That summer was a whirlwind of meeting fellow food lovers in person. There was a camraderie, openness, and inclusion amongst fellow like-minded food lovers that I hope will happen again. And I remember from my fellow food friends that IFBC was one of the moments where food became culture here in Seattle, fully fleshed out with faces attached to names. While I can hope this wave of excitement will happen again for IFBC 2013, I’m instead thinking of the value that I hope to get at the conference. The agenda is great; a keynote from Dorie Greenspan, talks on relevant topics, and the opportunity to meet other great food writers is always exciting. To hear what drives other writers. What their angle is and what they focus on. What inspires them. What they hope to share from their writing. I’m looking forward to IFBC 2013 and the next steps of what results from it. As we get closer to IFBC 2013, I’m going to zero in and blog about this event in further detail. This should be fun, stay tuned. If I were Danny Meyer, where would I open a Shake Shack in Seattle? First off, this is not to say that the rumor line is purporting that a Shake Shack is in the works for Seattle. Secondly, there isn’t a Shake Shack on the West Coast. Thirdly, this is all speculative and meant to be fun. Lastly, Shake Shack is awesome and would be welcome in Seattle. Where they may open is what we’re pondering. I first learnt of Danny Meyer’s Shake Shack about four years ago. I was asking my friends for suggestions on places to eat in Manhattan. Amongst the usual suggestions one gets when going to the city (the Momofuku restaurants, Balthazar, Katz’s, etc) was this suggestion of a little burger joint in Madison Square Park. 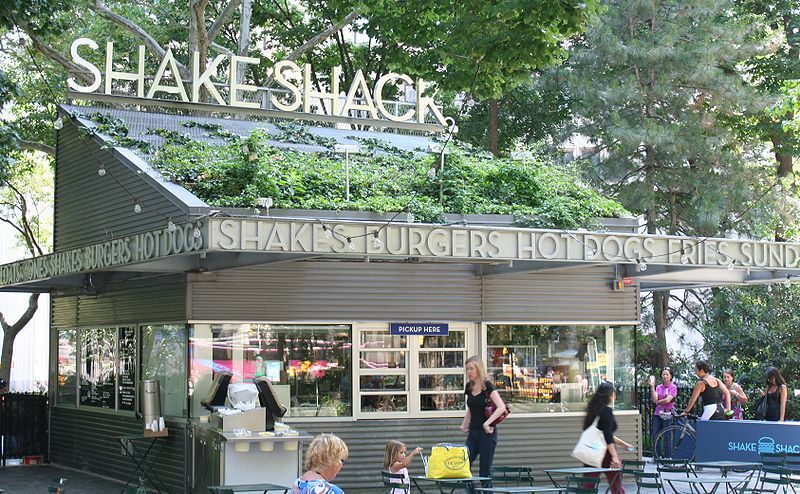 It was called Shake Shack and was one of the many restaurants from Danny Meyer. My knowledge of Danny Meyer (and his Union Square Restaurant Group) was nascent, but I had heard of him; that he was a restaurateur of the highest order, he wrote the book Setting the Table, and that was it. But Shake Shack was the place that I wanted to check. It was a burger stand in Madison Square Park. The lines were legendary. And their burgers and ‘concretes’ (milkshakes) were said to be delicious. We were staying nearby and knew we had to go. Of course it was tasty. But it wasn’t just the quality of the food at Shake Shack that made it great; it was the experience. The park setting was idyllic. The lines were long but were part of the experience and was managed well by the Shake Shack staff. The staff itself was professional and courteous. It was that experience that I keep returning to. A lot of people that try Shake Shack often say that they don’t understand what the big deal is. Which is an opinion they’re entitled to, but taken with just the burger is missing the point. When Shake Shack opens up new locations, it’s part of a cultural zeitgeist and can revitalize and energize the area near where it opens. And that is why we’re going to list out places in Seattle that I think would make sense if Danny Meyer would open up a Shake Shack in Seattle.